The heart of every Space Opera novel or setting is a star empire – or better: several of them. But what exactly is a star empire? On Earth we have seen the evolution of many nations and alliances of nations from the Roman Empire to the European Union. Assuming that mankind (or any other intelligent race) might one day colonize other worlds outside our solar system, there is a chance that some sort of order will come into being that ensures stability and prosperity (at least for a small elite). Yet, space is not like Earth, and simply transferring political systems from a single planet onto galaxy spanning societies will most likely not work or be realistic. A group of nations or peoples ruled over by a supreme power in governing: usually a territory of greater extent than a planetry system. regulatory power there would take another couple of years, you will never see a star empire evolve. So we need another mechanism of travelling to distant worlds fast. The only theoretical way is using gates. The nature of those gates doesn’t matter much. They can be wormholes/warp drives or ancient artifacts from a long gone race or something else. The idea is to negate the natural distances between stars. Travelling to a colony should not take more time than a few months maximum. As long as people represent political power in an empire, they must be able to enforce it on the ground. Controlling law enforcement remotely will only work for a time – given time and certain circumstances, even loyal forces break away and side with the oppressed or dissenters. The superior ruler must be in a position to suppress or combat any state-threatening resistance within a reasonable period of time. The further the subordinate units are from him, the more difficult it becomes. Connected to speed is the reach of expansion. Travelling at sublight speeds will drastically limit the size of an empire to a handful of systems. Using gates allows for a larger empire, but this depends on several other factors. Having almost instant travel allows for much larger empires where only ressources and empire age define the outer limits (and alien frontiers, for sure). If systems are connected by a network of gates the amount of transfers and the cumulated time will set the limit of the star empire. Ancient gates constructed by a superior race could allow instant travel (=no time) from system A to B. The network of systems would be clearly defined by the network of gates. Some systems could have several gates, making them interstellar crossroads, gates could connect systems that are not habitable at all, forcing travellers to make several additional transfer or „jumps“ to reach a specific destination system. Using a gate could have other hindrances like huge power consumption which is nothing different than time (charging up/cooling down). Inner system travel could still be slow as only conventional drives (even very efficient ones) are available. Gates could be located far from habitable objects in a system, probably close to the star, maybe to protect beings from the side effects of the jumps (huge energy release, gravity distortions, radiation) or to use the star itself as a power source. Wormholes would probably not exist in near orbit of your ocean world. So, even taking out the time constant for travel between systems, travel within systems would take some time per transfer/jump. 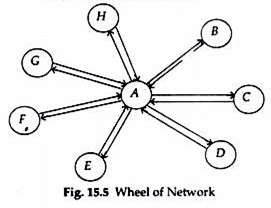 A linear network allows for a rather limited empire with many problems. If your capital sits in A (picture to the left), the total of jump times define if you can have colonies beyond E, even if systems further away have gates connected to them. If jump time is very short (let’s say 1 day) your linear empire could contain up to about 100 systems (taking roughly 3 months of travel time to get there). If jump time is medium (1 week), your empire will only consist of only about 12 systems, if a jump takes a long time (1 month) your empire will only contain 4 systems. If a jump takes even longer (3 months inner system travel time) it’s unlikely that your colonies will form a stable empire at all (in Pict. A a ship would require 1 year and 3 months to get from A to E). One issue is, if System C, for example, secedes from your empire or blocks jumping ships, you will loose control over a large number of colonies. If your capital sits somewhere in that chain (Pict. 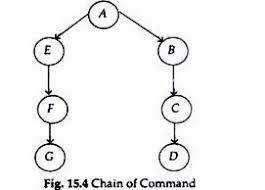 B) and the two chains of gate connected systems continues forever, your empire can control up to 200 systems (1 day/jump). With 1 week/jump you still would have about 25 systems in your realm, but sending a force or goods from a far colony on branch A to a far colony on branch B would take very long (up to 6 months). Again, your empire can be cut in half by a single colony blocking access to it’s gate. Your empire could have a multitude of such linear networks all originating from a single system. This only works if humans are the originators of those gates. It requires one system (your capital) to have two gates for some reason. Ancient builders would probably not have created such a condition without a very good reason. In such a wheel type nework your capital system would represent the starting point and the empire would branch out in all directions (assuming a three dimensional grid, a two dimensional one would also be possible). This allows for much more systems within reach and a more stable empire as only pockets of systems could secede without endangering the whole empire. If your network contains one or more systems with multiple gates, a three dimensional network is possible. It can be centralized (only your capital has a multitude of gates), decentralized (several systems have multitple gates connecting to new systems with only one gate) or distributed (all systems have multiple gates forming a tightly woven net). You could also have a party distributed network, where only some systems have multiple gates that connect to other multiple or single gate systems. The centralized network type empire can have many more worlds than the linear ones. Each single branch can have a size of up to 100 systems (1 day/jump), the amount of branches is only limited by the nature of the gate(s) in the central system. It could be a single gate that can be set to a destination per jump. Or several hundred gates. Such an empire could easily have several thousand colonies, all within reach of the government. Controlling the central gate(s) is crucial to control over the colonies. Entire branches could secede or get blocked from the empire, still. But they would also rely heavily on the central command and trade system, making such a scenario less likely. This is your typical layout for an expansionist species that started building gates in all directions – you just need a good explanation for the nature of those gates as they will hardly be natural. How do you reach a system without a gate in first place to set up one? Another question is why do you build long branches (with all inherent backdraws) instead of more gates (creating a pin cushion layout) that allow shorter travel times. 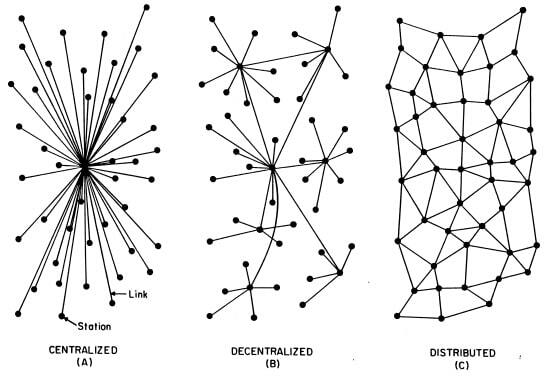 The decentralized networks is a typical seed scenario, where colonies were created in a slow process of travel (probably using generation ships) and most still lack the ability to create sibling colonies by themselves. You will have a central system with many gates connecting to older colonies with several gates that connect to new colonies with only a single gate. 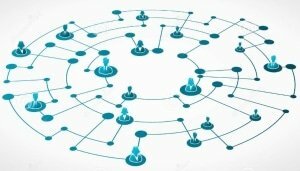 A partly or fully distributed network requires a very advanced technology level. Even if it is irregular in layout (including deadends) it would only be possible for a race that had plenty of time several ten thousand to millions of years) to create it. It would have long and short routes to the same destination. Whoever created it had a very good understanding of the systems involved. Jump networks measure distance in travel time, not in kilometers or light years or parsecs. Two connected systems could be a few lightyears apart or sit in entirely different galaxies or regions of the universe. There had to be a very good reason to connect certain systems and ignore so many million others. An advanced race would probably not care much about minerals or ressources found in some of them. A supreme power is necessary to govern such a huge civilisation. It can be democratic or dictatorial, but it must have supreme power in one hand It must be able to send military or police forces to the colonies in quick response to any uprisings or attempts to secede. Colonies must rely on the central government politically and economically, otherwise there is no need to be part of a star empire (colonies can be occupied territories, though). A civilization developing strong AI or advanced nano-technology will probably never create a star empire. Creating strong AI or even a Super Intelligence will most likely be the end of the biological race that developed it. AI ships might travel to distant systems, too, but it is doubtful that they will create a star empire that resembles anything that humans would have built. Nano-technology makes leaving Earth quite unnecessary as all problems on Earth can be solved by that advanced technology pretty easily. That „Pandora’s Box“ will create a stranger future though, than anyone can thing of and most likely not a human star empire. Colonizing distant worlds must be more rewarding than staying at home. It takes a lot of ressources to colonize a world (even or especially if you only build orbital habitats). People will leave Earth and colonize other worlds if they are forced to (low gain if the stay) – if Earth is hopelessly overcrowded and spending all the ressources, fuel and effort to build a distant colony rewards people with a pace to live and probably make a living, they will go. If mining ressources in colonies allows people to make a profit (sell ressources that are not required to build the colony but are demand elsewhere) they’ll be more willing to go there. The ROI (return on investment) decides whether a world is going to be colonized or not. Colonies need to be stable ecosystems from the beginning, the can not be started by a couple of dropouts. You need to send at least 40,000 people to create a new colony so that it does not die out again immediately. You will send them in many ships (probably 2,000 people per ship) to minimze catastrophic failures and avoid total loss situations. This is nothing people and governments or companies will do out of curiosity. Star empires will only arise if certain conditions apply. You will mist likel not see a colorful combination of drive technology, motivation and economical needs in a star empire, but rather dull and pragmatical conditions. Most star empires will not have a hereditary emperorship, by the way.